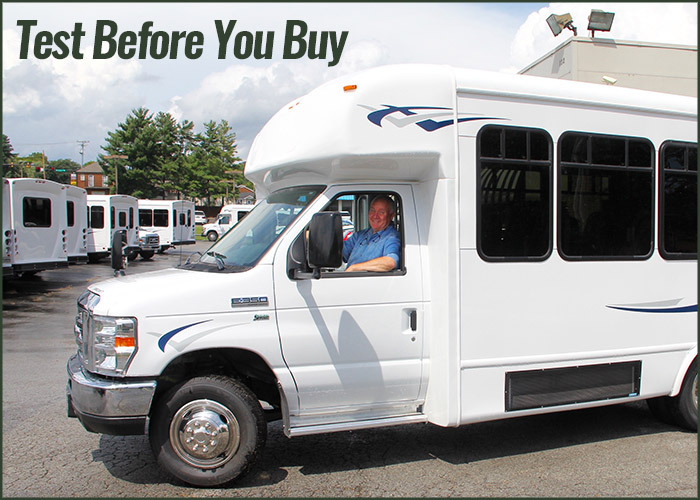 We have discovered that sometimes it is necessary for our customers to check out a new or certain, late-model used bus before making a commitment to purchase it. Therefore, we have developed a program that will allow you to use the bus for a thirty (30) day period for a nominal inspection fee. This program allows prospective customers the ability to try out a bus for 30 days to see how the bus works in the organization’s particular situation. A prospective customer, who is interested in purchasing, will select the bus they are interested in buying and one of our bus specialists will find a matching model in our inventory. After a demo bus is selected, the customer will add our bus to their insurance for a period of 30 days. After test driving the bus, if the customer decides to purchase the vehicle, 100% of the inspection fee will be credited toward the purchase price. If you decide not to purchase the vehicle, return it to our dealership after 30 days, and the inspection fee will be forfeited. If you decide upon another bus or van, 50% of the inspection fee will be credited toward that purchase. The program applies to stock units only. Vehicle must be picked up in Franklin, TN and returned to Franklin, TN if not purchased. Inspection fee due in advance. A CDL with “P” endorsement required for buses with capacity of 16 or more passengers. F750 Chassis requires a Class B license with the Air Brake endorsement. All routine maintenance to be responsibility of rentor. Monthly inspection fee based on 3,000 free miles. Add $0.60 per mile for all mileage over 3,000 miles. Insurance shall be provided by the rentor with Carpenter Bus Sales listed as additional insured and loss payee on the Certificate of Insurance. All terms and conditions of the Carpenter Bus Sales standard rental agreement shall apply to this program.